EPI Vice President Ross Eisenbrey delivered the following testimony before the U.S. House Committee on Small Business on June 23, 2016. I am Ross Eisenbrey, the vice president of the Economic Policy Institute, a nonprofit, nonpartisan think tank created in 1986 to include the needs of low- and middle-income workers in economic policy discussions. EPI believes every working person deserves a good job with fair pay, affordable health care, retirement security, and work–life balance. We applaud the Department of Labor and President Obama for at long last updating the Fair Labor Standards Act’s rules requiring overtime pay for salaried employees. Millions of people will get raises, reduced hours for the same pay, or new jobs because of the Department’s action. Work–life balance is a fundamental goal of the Fair Labor Standards Act (FLSA). Its requirement for employers to pay employees a premium for time worked beyond 40 hours in a week makes the FLSA the single most important family-friendly law ever passed in the United States. Excessive work is detrimental to family life, health, well-being, and productivity. If not for the law’s overtime rules, tens of millions more workers would be working 50, 60, or 70 hours a week for no additional pay, just as millions of Americans did before the FLSA was enacted in 1938. An uninformed person might think the 40-hour workweek is part of the natural order, but of course it isn’t. It exists in the United States because President Roosevelt persuaded Congress to pass the FLSA, which—by imposing the duty to pay time-and-a-half for overtime—makes it expensive for a business to work employees more than 40 hours a week. (Similarly, the weekend was not a given for most Americans before passage of the FLSA; six-day workweeks were common.) If the FLSA’s regulations are not updated from time to time, as the law intends, the 40-hour workweek could become a thing of the past. Right from the beginning, the law has applied to salaried employees as well as hourly workers. Congress recognized at the outset that there’s no inherent difference between an hourly worker and a salaried worker. How they are paid is entirely up to the boss. And salaried employees need time with their families and time for themselves just as much as hourly workers do. Congress ensured that hourly workers and salaried workers alike were entitled to overtime pay, whether they were blue collar or white collar, whether they worked in a factory or an office. In fact, some of the most exploited workers at the time were women working 12-hour days, six days a week, as typists in giant office pools for $6 or $7 a week. It’s equally critical to remember that the employees who work in small businesses and nonprofits are no different from those who work in medium-sized and large businesses; they too need time with their families and for themselves. There is no good reason for small businesses to exploit their employees, work them excessive hours, or deny them time with their families. The same goes for nonprofits. EPI is both a nonprofit and small business entity. We will not only find it easy to adjust to the new rule, we will actually find compliance simpler thanks to the new bright-line test for employees paid less than $913 a week ($47,476 per year). For all of these reasons, the Department of Labor’s final rule to raise the threshold salary (the level below which all workers are automatically eligible for overtime) to $47,476 is overdue. When it takes effect on December 1, giving new protections against overwork to 12.5 million employees, it will be the most important improvement in the labor standards of America’s working families in many years. An Ernst & Young survey found that too little pay and excessive overtime are among the three most common reasons employees quit. Approximately half (46 percent) of managers work more than 40 hours per week, and four in 10 say their hours have increased over the past five years. Younger generations have seen their hours increase the most in the last five years, at a time when many are moving into management and starting families (47 percent of millennial managers reported an increase in hours, versus 38 percent for Gen X managers and 28 percent for boomer managers). “Millennials (78%) are almost twice as likely to have a spouse/partner working at least full-time than Boomers (47%). Millennials (64%) and Gen X (68%) were also much more likely to have a spouse/partner working 35 hours or more a week than Boomers (44%). Over a quarter of Boomers (27%) said their spouse/partner does not work outside the home or works part-time flexible hours (10%). Millennials (13%) and Gen X (14%) were much less likely to have a spouse/partner who did not work outside the home or who worked part-time but flexible hours (5% and 4% for millennials and Gen X, respectively). It’s not just work–family conflict, stress, or lack of sleep that’s at stake; it’s also the physical health of the workers. Overwork kills. People who work 55 hours or more per week have a 33 percent greater risk of stroke and a 13 percent greater risk of coronary heart disease than those working standard hours.4 When employers don’t have to pay for overtime, they schedule much more of it, leading to the many stories among the rulemaking comments of managers working 60-hour weeks and longer until their health was destroyed, leaving them disabled. * The sample included salaried (nonhourly), full-time workers who are 18 years or older. It excluded teachers (pre-K through college) and religious workers who are automatically exempt from overtime protections. Note: The nominal threshold was set at $250 per week from 1975 until 2004 when it was increased to $455 per week. The other purpose of the overtime rules was to reduce unemployment by reducing the average number of hours worked in certain jobs, thereby freeing up positions for additional workers. To maximize employment, it’s obviously better to have three employees working 40 hours per week than just two working 60 hours each while the third is unemployed. U.S. underemployment is still almost 10 percent seven years after the end of the Great Recession—that’s 15 million Americans who want a job or more hours but have not been able to find them. Black unemployment is a recession-like 8.2 percent. Many businesses are unhappy that the Labor Department is restoring overtime coverage almost (but not quite) to where it stood in the Ford administration. Businesses have become accustomed to working low-level salaried employees long hours for no extra compensation, but the pendulum has swung too far, and it’s time to restore some balance. The arguments against the rule are uniformly without merit. Let’s examine the four most prevalent of these arguments. A. DOL probably overestimated these costs. Every firm that has an obligation to comply with the FLSA has already made a determination about the duties of its current employees and whether they can be exempted under the law’s provisions for executive, administrative, and professional employees. The new rule makes this process much simpler for employees earning below the threshold. Here’s the key test: “Does the employee make less than $913 per week?” If yes, pay overtime. “Our store managers and assistant managers averaged a 40 hour work week last year. Management closes the stores two days a week, and on those days they come in at 10am and leave between 6:15pm and 6:30pm. They also work one Saturday a month, for which they are given a day off during the week. During ‘crunch time’ weeks, a manager will work more than 40 hours. A. The National Federation of Independent Business (NFIB), for example, claims that employee morale will be hurt because employers will not just reclassify some managers as hourly but will also demote them, take away the manager title, take away their paid time off and their health benefits, and stop letting them leave early to pick up their kids from school. All of that is pure nonsense. Nothing in the rule makes an employer change a manager’s title or take away anyone’s benefits, and it would be poor management to do so if it were going to harm morale. B. NFIB assumes that businesses will insist that employees continue to work long hours and will refuse to pay anything additional for overtime. NFIB says employers will instead cut wages by as much as $5 per hour in order to keep their total wage bill unchanged. That has not been the history of the FLSA. We know that hourly workers are less likely to work long hours than salaried employees, and there is little evidence that employees’ wages were ever cut this way in the past. B. The opportunity argument is indefensible. If my business promotes employees paid a salary of $25,000 to $47,000 into management but the rule leads me to reclassify them all as hourly, they’re still the same employees I would look to for promotion. The pool of employees from which to choose for promotion into management doesn’t change. Where else would I look for people to promote? A. This argument was made about the proposed rule, and the Department of Labor responded to it by lowering the threshold salary from $50,440 to $47,476, the 40th percentile salary in the poorest region of the country. B. The salary level is meant to do one thing: prevent employers from denying a 40-hour workweek and overtime pay to people who aren’t really executives and professionals. It doesn’t set salaries; it reflects what bona fide executives, administrators, and professionals are paid. C. The $913 weekly level in the rule is not high; it is so low that it isn’t sufficient to provide a two-parent, two-child family with an income level necessary to live adequately yet modestly.8 This is not truly an executive-level salary if an employee cannot support a family in a modest way on that salary. D. The salary levels for exemption have been set nationally since 1938, without exception. E. In inflation-adjusted terms, the equivalent salary level in 1975 was $57,462, according to the U.S. Chamber of Commerce’s testimony. That level took account of regional and urban/rural differences because it was an inflation adjustment of earlier levels that took them into account. Regional pay differences are much smaller today than in 1975, so the salary level in the rule actually overcorrects for regional differences. Moreover, the fact that it is well below the 1975 level despite decades of productivity growth and accelerating income growth for executives means the salary level is too low rather than too high. F. Managers paid less than the level necessary for a two-parent, two-child family to make ends meet anywhere in the country, whether they live in rural or urban areas, should not be treated as exempt executives; they should be paid for their overtime. The Secretary of Labor has done what the law requires in resetting the salary test to a level that better reflects the compensation of bona fide executives, administrators, and professionals. In doing so, he is making the most important improvement in the labor standards of America’s working families—particularly middle-class families—in many years. The rule should be applauded and supported. 1. Ernst & Young, Global Generations: A Global Study on Work-Life Challenges Across Generations, 2015. 4. Mika Kivimäki et al., “Long Working Hours and Risk of Coronary Heart Disease and Stroke: A Systematic Review and Meta-Analysis of Published and Unpublished Data for 603,838 Individuals,” The Lancet, August 20, 2015. 5. 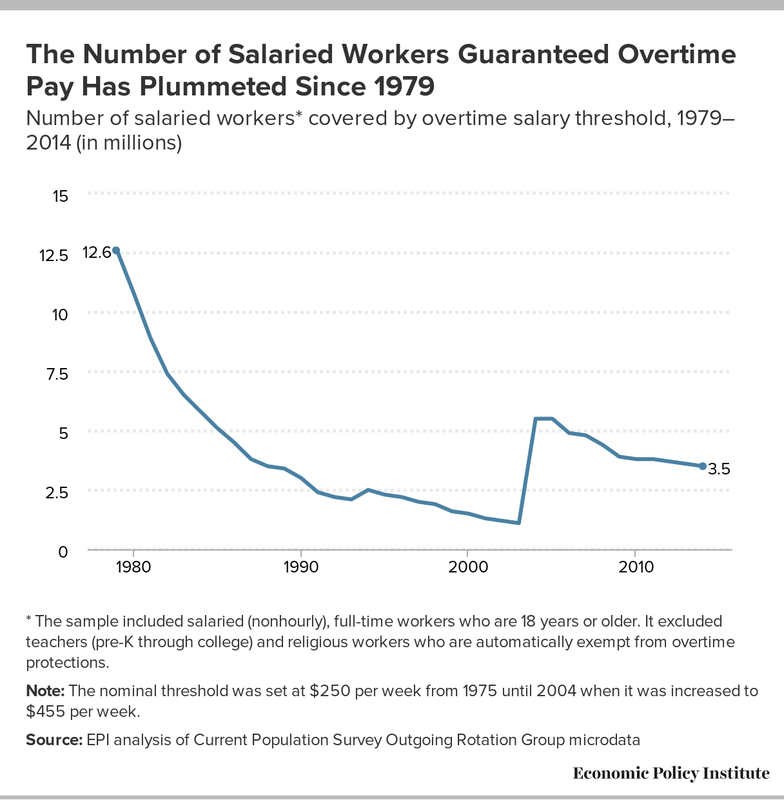 Ross Eisenbrey, “The Number of Salaried Workers Guaranteed Overtime Pay Has Plummeted Since 1979,” Economic Policy Institute Economic Snapshot, June 11, 2015. 6. L. Camille Hébert, et al., “Law Professor Comments Regarding ‘Defining and Delimiting the Exemptions for Executive, Administrative, Professional, Outside Sales and Computer Employees,’” submitted to U.S. Department of Labor September 4, 2015. 7. Lonnie Golden, Flexibility and Overtime Among Hourly and Salaried Workers: When You Have Little Flexibility, You Have Little To Lose, Economic Policy Institute Briefing Paper #385, September 30, 2014. 8. Elise Gould, Tanyell Cooke, and Will Kimball, What Families Need to Get By: EPI’s 2015 Family Budget Calculator, Economic Policy Institute Issue Brief #403, August 26, 2015.